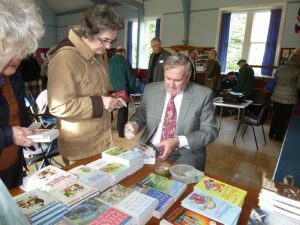 On the 8th of March the Forum held its annual open meeting when 110 members and guests filled the Church Hall, no spare seats being available. 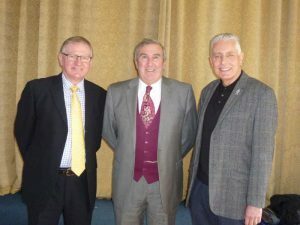 The speaker for this special occasion was the well-known Yorkshire author and raconteur Gervase Phinn who titled his talk The School Inspector Calls. In his introduction John Spinner described Gervase as the James Herriot of school inspectors and his talk proved that this description did not flatter him. Gervase introduced us to, among others, Benedict, a six year old with a remarkable vocabulary, and described an inspection he undertook at his old primary school when he met his favourite teacher and the former headmistress (now 104 years old). Each story caused great amusement but had a serious message about child care, literacy or general education. One of Gervase’s favourite subjects is spelling and he asked us who we thought was the best speller of modern times. We were surprised by the answer – Enoch Powell. We learnt one or two tips on how to improve our spelling and then Gervase progressed to malapropisms before completing his talk with two poems about his parents. A member of the audience asked whether he had ever been involved in the theatre and he revealed that he had spent some time in youth theatre playing a variety of classical roles. The Forum Chairman Mike Earle thanked Gervase for his most entertaining talk and the audience joined in with loud and appreciative applause. This entry was posted in Talks, The School Inspector Calls and tagged diarrhoea, education, Enoch Powell, Gervase Phinn, malaproprisms, poetry on March 8, 2017 by webmaster.